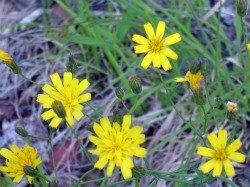 Gregory Bald, Take a "Wildflower" Adventure! The hike to Gregory Bald is a must no matter what time of the year you go. The main draw is the flame azaleas that bloom in June. Even if you don't hike to it then, still go. The amazing views still make this hike worth it. When we hiked to the bald in May we saw loads of wildflowers- mountain laurel, trillium, pink lady slipper... While it's a steady uphill climb to the bald, it's not real steep. Along Gregory Ridge Trail you'll cross the creek on footbridges and you'll pass a backcountry campsite. You'll come into an outcrop that offers nice views. Keep an eye out for wildflowers all along the way! When you get to the junction for the bald take a right. When you get to the bald, you'll be in awe over the views and if you're lucky to be there in June, you'll see some beautiful azaleas too. It's a perfect spot for a picnic, cloud watching, a little snooze, or all of the above! Balds came about by cattle grazing before the Smokies became a national park. 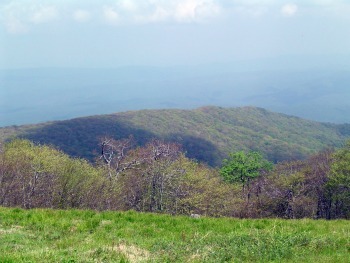 Gregory Bald is one of the two balds maintained by the park. The other is Andrews Bald. Approximate Elevation: Starts at just under 2000' at Forge Creek Rd. 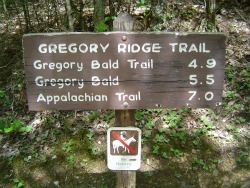 Trail ascends to 4000' at Gregory Bald junction and continues ascending to just under 5000' at Gregory Bald. How to get to the trail: Take Cades Cove Loop Road (on the Townsend, TN side of the Smokies) and turn on Forge Creek Rd. (just past Cable Mill). Drive to the end of the road, passing Parson Branch Rd. Park in the lot at the end where Gregory Ridge Trail starts.